The Tayrona National Natural Park is located 34 km far from the urban centre of Santa Marta, in the department of Magdalena. It is one of the most important natural parks in Colombia. The Park is also considered one of the most significant ecological reserves in South America due to its rich flora and fauna, uncontaminated beaches, archaeological remains, waterfalls, creeks and much more. On October 28th we decide to visit the park. We start from Santa Marta at 8.30 am with a minibus from "El Mercado" (for 6,000 Colombian pesos - about € 1.70) and after an hour we arrive at the East entrance of the park called "El Zaino". As soon as we arrived there is an illustrative video of the national park. It is very useful to receive information about the park including the prohibition of swimming at some beaches due to strong currents. We pay 8,000 COP because we have the student's international card. Then we take a minibus for 3,000 COP which takes us to the first parking spot from where the journey begins. You can also choose to walk for 3 km but the initial part of the route is nothing special, so better save your strength for later! We start the trekking at 10.30 am and immediately we notice the high humidity level in the forest. In addition to the heat, we are also carrying a 5 litres water tank each because we were told that it is difficult to find water inside the park. We have a backpack too of about 7 kg with the food needed for 3 days. You cannot imagine how hard it was! Therefore, we strongly recommend to get a couple of litres of water but to buy the rest inside the park (at the two available campsites) although at a slightly higher cost. After 2 hours, exhausted from the heat and tiredness, we reach the first campsite: Bukaru. It is a very peaceful place, with few people and not far from the sea. We pay 15,000 COP for a hammock with a mosquito net. In the afternoon we decide to visit the nearby beaches. The first we meet is Cañaveral but the waves are so strong that here it is forbidden swimming; the same for Arrecifes beach. Then we continue for 20 minutes and we find La Piscinas beach where it is finally possible to enter the water to cool off a bit and to get rid of this crazy humidity. The colour of the water is not the best because of the storm of a few hours earlier. Anyway, it is a good opportunity to relax and enjoy this natural landscape immersed in the jungle. In the late afternoon we return to the campsite, we have dinner (with tuna, tomato and rice crackers) and we go to bed very early, as there is no electricity or much else to do. The next morning, we wake up with the sunrise. 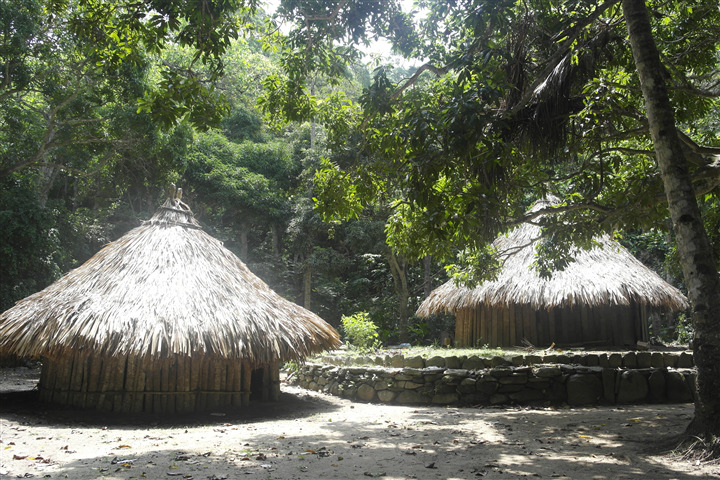 At 9.30 am we start the trekking to the main attraction of the Park: Cabo San Juan. We take about 40 minutes to reach it. 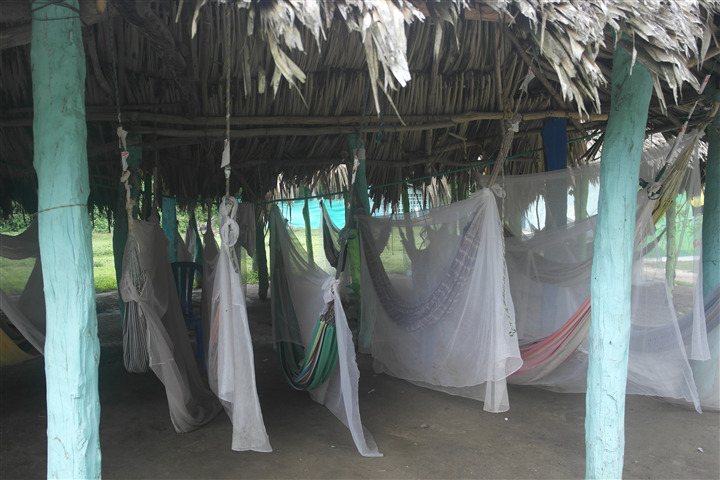 Here it is possible to have a hammock for 20,000 COP without a mosquito net. This campsite is bigger than the previous one and also seems to be much more organized, with even power generators. Once left the backpacks in the lockers available in the camping, at 10.30 a.m we walk towards El Pueblito, a small village of indigenous houses populated by about 2000 people between 600 A.C. and 1600 D.C. The trek lasts around 1 hour and a half. We walk, mostly uphill, among boulders of giant stones with a humidity level never felt before!In our opinion, the fatigue is not very worth it. When we arrive, in fact, we find only 4-5 circular houses made of stone and straw. It would undoubtedly have been much more exciting the trekking to the Lost City - “Ciudad Perdida”, one of the most iconic places in all of South America, but you can only do it by purchasing a tour of 4-5 days for about 700 COP (too much for us!). On the way back we have the brilliant idea to try an alternative and apparently easier route, suggested by local people. Unfortunately, this route is not only more difficult by being very slippery due to the heavy rains of these days, but also much longer. Indeed, it leads us to a nudist beach that seems almost with no way out because of the high tide. Twice we are forced to look for alternative paths in the forest because the beaches are completely covered by the water due to the strong waves. Finally, we return to the campsite at about 3 pm, exhausted and hungry! At the end we decide to buy bread with cheese and tomato for 4,000 COP and an arepas for 3,000 COP at the restaurant of the camping. Then we throw ourselves on the beach to rest a bit and we wake up with the sound of rain and thunder! Now it is the moment of the shower. Yes, because fortunately here there is also running water. The showers, however, are really strange: unisex showers with a sort of very small curtain not enough to cover all the body. Not to mention the endless queue to do. But we do not complain about it and we are happy for being able to use it! We head to the hammocks at 9.30 pm when the lights are off. But first, we stop on a bench near the sea to enjoy the silence and darkness of the night that gives life to hundreds of stars in the sky. Sleeping in the hammock is not exactly the most pleasant way to rest. The temperature drops a lot during the night and you can also feel the humidity. Moreover, the camp is very crowded and, in addition to the mosquitoes that buzz in the ears, there are those who snore a few inches away from our hammocks. But we are so tired that we sleep like babies! The following morning, after spending a couple of hours at the beach, we do again the trek of about 3 hours to return to the parking spot where we take the minibus. We spent only 3 days in this place which has amazed us both for its biodiversity and for the beauty of its unspoiled landscapes. A short but sufficient period to appreciate one of the most beautiful and sacred places in Colombia. In fact, it is a park still inhabited by few local tribes which have this place really close to their heart. Indeed, they asked for the closure of the park from the 1st to the 30th of November 2015 for a process of "detoxification" by tourists and therefore to allow this sacred place to regain its initial balance. What to bring for 3 days: water (at least 2 litres a day), food (the amount depends on your willingness to eat at the restaurants in the park), light clothes (in addition to jumper, long pants and socks for the night and to protect yourselves from mosquitoes), sunscreen, anti-mosquito spray, swimsuit, hiking shoes, torch, hat for the strong sun and of course a good camera to capture these incredible landscapes!